In Carnivores: Dinosaur Hunter, the most fearsome monsters of the prehistoric world are your prey. 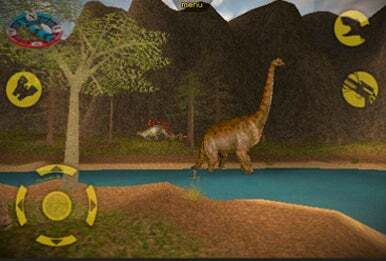 Based on the 1998 PC hunting game by now-defunct WizardWorks, this new iPhone port by Tatem Games revisits the ground laid by the earlier iteration of the franchise, in which you track 15 types of dinosaurs across five sprawling, 3D-rendered areas. Remember they hunt in packs. AHHH!!!! There are two modes: a quickplay “Survival” mode, that has you screaming “Get Some!” as you gun down waves of formerly-extinct beasts, and a “Hunt” mode, in which you not suprisingly hunt a specific species. As the game progresses in difficulty, so does the prey, beginning with dim, but flighty Parasaurolophi, to quick and deadly veloctiraptors, finally to a monstrous, belligerent tyrannosaur. To protect themselves, your potential prey uses smell, sight, and hearing (each species of dinosaur has varying levels of each), which when the hunter is sensed, activate a flight-or-fight response (herbivores tend to run, while carnivores prefer to feast upon your tender, camo-wrapped flesh). The player is given the usual assortment of FPS weapons, such as pistol, shotgun, sniper rifle, and “X-bow” (not as cool as it sounds). In addition to this, the player uses radar, wind direction, and a special dinosaur call, which features an odd, but charmingly distinct assemblage of sounds. The anklyosaurus has a sort of a clanking, ashmatic rasp while the allosaurus sounds like Barney Gumble through a Korg synthesizer. Finally, the Parasaurolopharus sounds vaguely like a vuvuzela. Hunting them down is not surprisingly satisfying. Despite the light camp and constant pixelation delivered by this faithful port of the dated AtmosFear engine, Tatem Games has reproduced (with imperfections) an aspiration of every red-blooded gun-owning American: to finish what Nature started and blast those coldblooded reptillian fiends to kingdom come. Still, “Carnivores” has its obvious shortcomings: The story is ludicrous. The graphics and rendering fail to make use of the capabilities of the platform, and the campaign-style “Hunt” mode can become tedious. While the new iPhone port adds an “Achievement” function (I was able to earn ‘Ornithologist’ for downing a Pteradon), as well as leaderboards and social networking support, even at your most charitable it’s impossible to come away from this one without feeling they could have done more. The Takeaway: Though this clumsy port leaves a lot to be desired, there are some moments of anachronistic fun.